Hello lovelies! I have a little Birchbox preview for you today! Thats right! Birchbox sent me a few items to give ya'll a sneak-peek of what will be inside your Feb Birchboxes!!! Now, don't quote me...I don't know if everyone will be getting these in your Birchbox as the boxes do vary a bit. But, you might! What is Birchbox? It is a monthly beauty sample service. You get deluxe sized beauty samples beautifully wrapped in a gift box with lots of beauty tips and product info for only $10 per month. I won't go into more detail as you can check out my previous monthly Birchbox Openings and my Birchbox Intro to find out more! :) I am a huge fan of Birchbox. Its just a lot of fun to open the box every month and sample new products. Hmm...I sense a theme here with the upcoming box...makeup stickers! Sounds hokey, right? I'll admit it. When I opened up my package and saw the products, I thought "gimmick". Makeup stickers??? These can't be comfortable to wear? How can they last? Or look natural? Well ladies, natural is not the idea here with these. These are *bold* products meant for "fun" wear. Most women just don't go for glitter lips and wild liner everyday. But for fun occasions...maybee!?!? Normally I do go for very natural makeup. I am a nudes and neutrals girl. Bright colored lipstick and nail color is normally about as wild as I go. But, on occasion, I do love doing crazy-fun lashes and do get a bit more experimental with makeup if going out on the town. The look that you will get with both of these products is *bold*! Also, you are going to have to really practice to get the application right (and not look totally silly). But, generally, I think of Halloween with something this bold (or Lady Gaga). 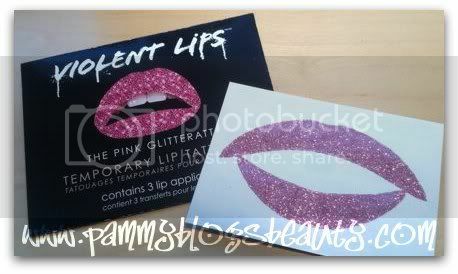 These are glitter lipstick stickers. You get 3 in a package (not sure how many will be in the Birchbox). They go on exactly like a temporary tatoo. You basically cut the tatoo to the shape of your lips (there are guidelines on the back of the tattoo...measure your lips and then cut) and then stick on. Then you take a wet cotton ball and press along the tatoo and then peel off the backing. What do I think? 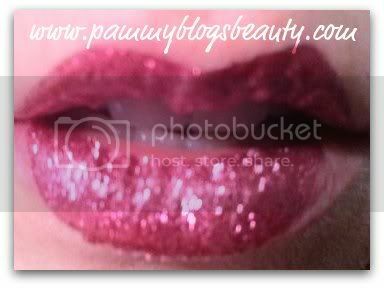 The idea is great...glitter lips! But, I don't quite like the "feel" of them on my lips. I found it a bit tricky to get the correct lip shape. I ended up applying lipstick and pressing my mouth to the back of the backing to make a lip "shape"...then I cut around the shape. Application itself was a bit awkward and it will certainly take some practice to get it perfect. These are actually something that I might wear next time I hit a nightclub (but, I must admit I rarely do that these days!). Maybe I will pack these for my next trip to South Beach (Barbara, I am ready!!!). Or maybe I will just give these to my niece for dress-up (shout-out to Mollee!!!). These are Eye Liner Stickers. You get 4 different pairs in a package (again, not sure how many will come in the Birchbox). These are super basic as far as application: Just peel off and apply. These are super bold! Wow! They are about 3x thicker than how I normally wear my eyeliner. Honestly, I do not think winged eyeliner is that tricky. It is much easier (and more natural looking) for me to draw on winged liner with a liquid or a gel than fuss with eyeliner stickers. I found these to be somewhat difficult to apply. I needed to trim a good 1/4 inch off the inner corner for it to "fit" my eye. Also, I had trouble getting the inner corners to stick. The overall "look" is okay. These might be best worn in the dark when it won't be so obvious that you are wearing stickers. Also, I just didn't like the "feel" of the stickers on my eyelids. 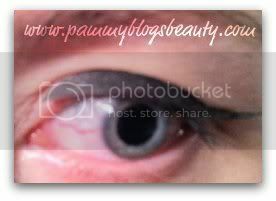 It is somewhat similar to the sensation of wearing false eyelashes (but, false lashes don't bother me...and these did). I ended up taking these off after wearing a short time just because I didn't like the sensation. If you don't think that you would be bothered by the "sticker" sensation and for experimentation with a more bold look...these might be great. 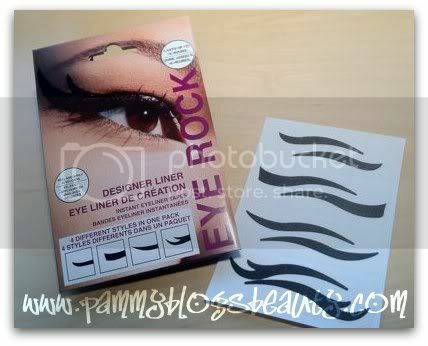 Or, if you want really bold liner and have difficulties with applying liquid, then these might be for you. For me, I think I will just stick to liquid liner. If you do try these, just know that it might take a bit of practice with the application. 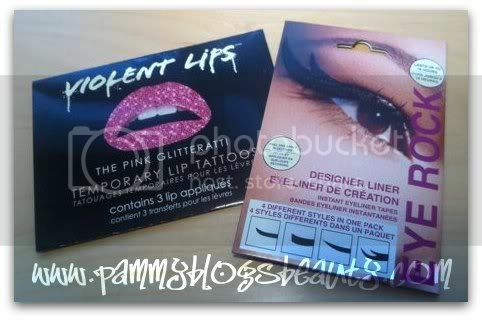 Have any of you readers tried either the Violent Lips or the Eye Rock Liners before? Any application tips? Both of these products give a very bold look. But, I really just disliked the sticker feel of the products on my skin. So, overall, these products are pretty much "fails" for me. I think that the Violent Lips has potential. If you can cut a realistic lip shape...and don't mind the sticker feel...they could potentially look really cool. Birchboxers, are you excited about possibly getting these items in your next Birchbox? I think these are good items for sample box as you probably don't want to pay full price to try out such "experimental" makeup. But, if you try as a sample, then you will know if you like them for sure. For me, I will likely pass on purchasing them. But, I had fun trying them out. Who knows, if I get the hang of application, I might just end up wearing my other pairs of Violent Lips next time I go clubbing in South Beach! Honestly these are 2 things I hope not to get...I don't see myself using either of them. The sticker part of it just turns me off. @Miranda-I wonder how many people will get these too? Even if I was able to get these to apply better, I dont think I could get past the feel of "sticker" on my face.